Within two years, the Convention had been ratified by 99 countries around the globe, making it one of the most quickly ratified international human rights treaties in history. Today, every country in the world is a party--with one glaring exception. For nearly a decade, the U.S. and Somalia shared the distinction of being the treaty's most determined hold-outs. When South Sudan gained independence in 2011, the pair of outliers briefly became a trio, until the world's newest nation became the CRC's 195th party in May 2015. In October, Somalia followed suit, making the U.S. the sole global exception. We've seen tremendous global gains since the CRC was adopted: the child mortality rate has been cut in half, more girls than ever are in school, and we've achieved near universal access to primary education. Country-level legal reforms implementing the CRC, such as the introduction of tuition-free primary school, helped initiate these successes. By contrast, in the U.S., we're falling behind other economically competitive countries across a range of children's outcomes--and our lack of commitment to children is revealing itself in our policies. Take child health. When the CRC was adopted in 1989, the U.S. ranked 23 out of 34 for infant mortality when compared to other OECD countries. By 2013, the U.S.'s ranking had dropped to 30th. Only Chile, Mexico, Slovakia, and Turkey have higher infant mortality rates than the U.S. Poverty is a major contributing factor, which is exacerbated by our relatively stingy safety net. Today, 20.9% of American children live in poverty, compared to the OECD average of 13.3%. Among them are 2.8 million American kids in households surviving on below $2 a day--a metric we usually associate with countries that are far less wealthy. We're also not doing too well when it comes to education: the U.S. currently ranks 27th in math scores out of the 34 OECD countries. 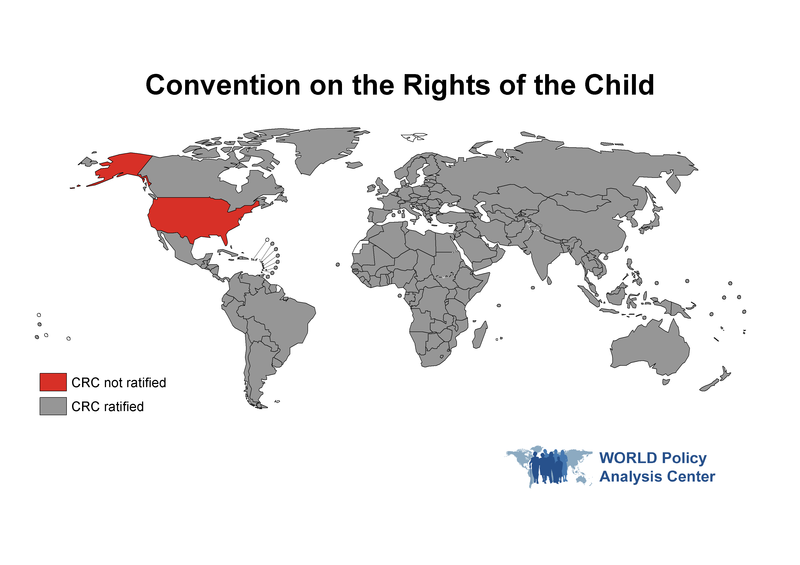 Meanwhile, the U.S. is one of the few countries that do not guarantee the right to education--a pillar of the CRC--in our national constitution. This omission is more than a technicality; it has had disastrous practical consequences. In a notorious 1972 decision, the Supreme Court upheld Texas' financing of public schools through local property taxes, finding that the Constitution does not explicitly establish education as a fundamental right and thus does not trigger a "strict scrutiny" review of the policy. This ruling laid the foundation for the ongoing segregation, massive disparities in school quality, and unequal educational opportunities that persist today. Notably, constitutions adopted after CRC ratification are more likely to guarantee the right to education. Finally, the U.S. provides little support for working parents to balance their jobs with their caregiving responsibilities. Paid maternity leave has numerous and well-documented benefits for children: it allows moms to bond with their new babies, it increases the odds that babies will receive essential immunizations, and it facilitates consistent breastfeeding--the single most effective child survival intervention. Yet the U.S. is one of only eight countries worldwide--and the only industrialized nation--that fails to provide paid leave to new moms--not to mention new dads. Likewise, working parents should be able to stay home when they're ill without risking the income they need to provide for their families, yet the U.S. is among a handful of countries that provide no paid sick leave. Ratifying the CRC won't be a quick fix to these challenges. But it will make a difference. It will signal to both the U.S. population and the rest of the world that we're committed to investing in all our children's futures. It will strengthen the case for critical policy reforms that are already on the agenda, like paid family leave, that will both support American families and make us more economically competitive on a global scale. It will lay the foundation for further reforms to reduce disparities in children's health, education, and wellbeing that will pay dividends for generations to come. And it will bring the US back into the global community when it comes to improving the conditions children face around the world.